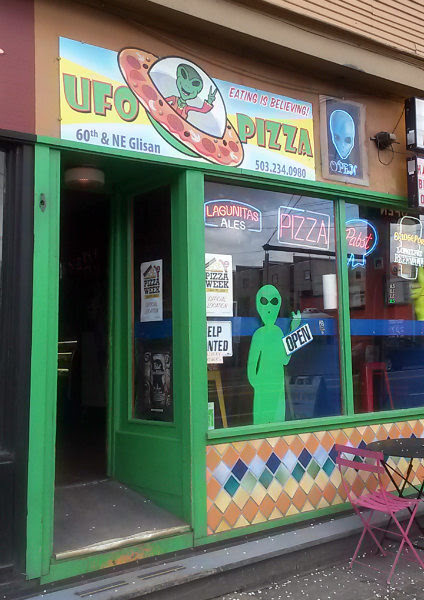 After reading many recommendations to go here for Portland Pizza Week 2017, I made sure to fit this into the schedule. 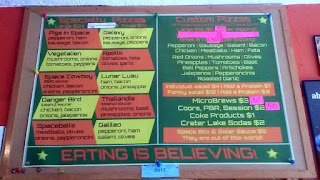 Scanning the menu, the Danger Bird and Thailandia pizzas are the most appealing, likely because of the peanut sauce. The former has meat, the latter no meat. Like most pizza places, you can make your own here as well and have a beer while waiting. 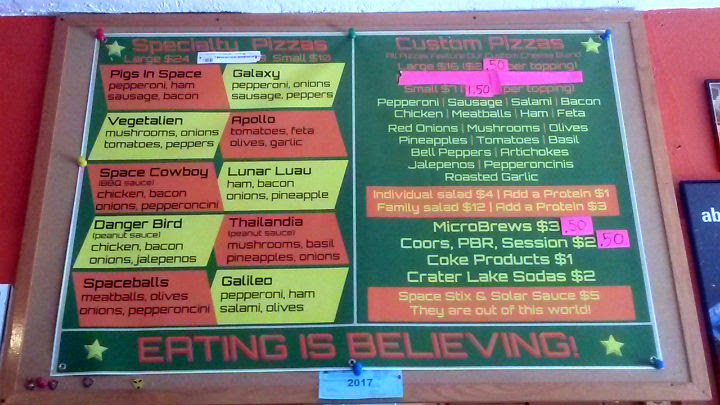 UFO Pizza offered their "Space Cowboy" as their $2 special slice. 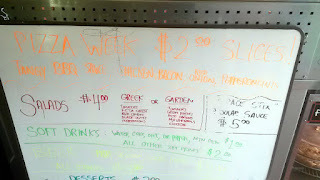 It's already a part of their regular menu, so you can get it anytime. 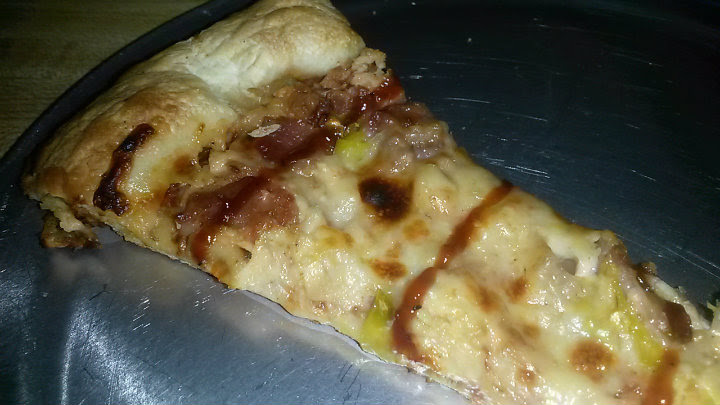 It features chicken, bacon, red onion, pepperonicinis, and a tangy BBQ sauce swirl. 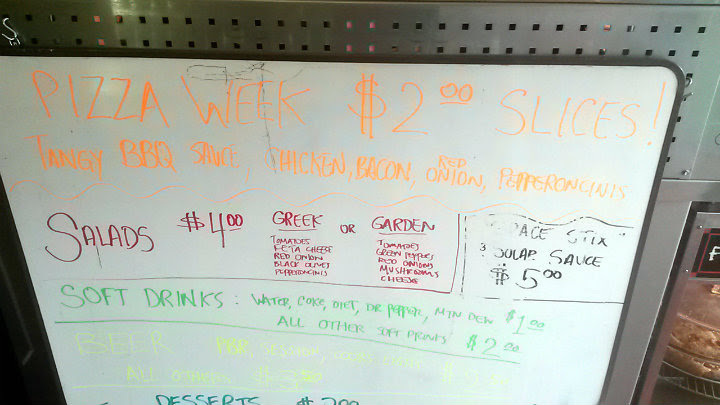 Vegetarians were also in luck, as the "Veggie-Q" is the same thing without the meats. 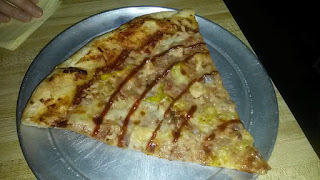 At this point in the food adventure, my two friends and I opted to have one full slice cut into thirds so we could keep putting off the food coma and get home safely. This was our fourth pizza stop of the day and sixth food/drink stop overall -- all in about a three-hour span. I loved this one as well, and it's great to know that I could get it even after Pizza Week was over. I'm a fan of tangy and sweet BBQ sauces, so this was right up my alley. I got the pepperoncinis and in hindsight should have just asked for a bunch to munch on. Good balance/ratio on the toppings. The crust was more french bread-like, good crunch, slight sourdough-y in nature, and a bunch of chewiness. 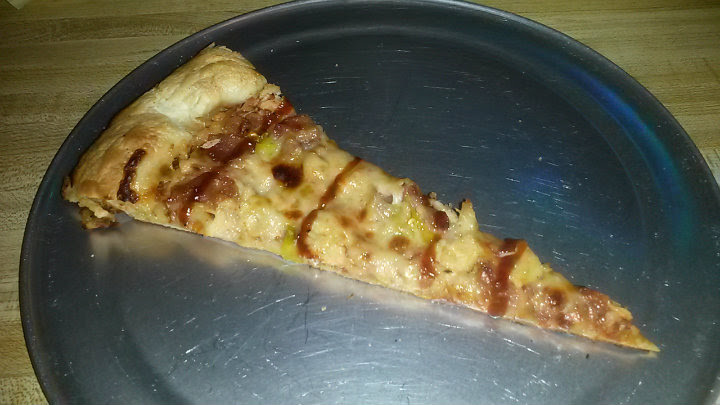 This is where I probably would have wanted some marinara to dip the edges in. Customary wait time on reheating of the slices, about 2-3 minutes again. As far as parking goes, hopefully you can find a space in front of the storefront, but otherwise, just park further down on Glisan or find a side street.